Agatha Christie is so closely associated with her famous home at Greenway in Devon that it is often forgotten that she had another home, purchased in 1934, which is where she died in 1976. This was Winterbrook, at Wallingford in south Oxfordshire. I’ve just come back from a few days spent in Wallingford, at a house a short walk along the banks of the Thames from where Christie used to live, and from her former boathouse, which still stands on the river. I’d never been to Wallingford before. It’s a quintessential English market town, with an excellent second hand bookshop among other delights (they had for sale a number of rare Gladys Mitchell novels in dustwrappers, as well as a copy of that marvellous detective story The Poisoned Chocolates Case, signed by Anthony Berkeley; alas the prices were out of my reach.) Apparently the town was the model for Market Basing, which features in stories such as Dumb Witness. Christie is buried nearby, in the graveyard of St Mary’s Church at Cholsey. Again, it’s a very English setting, in the midst of fields. The tombstone is large, elaborately carved and decorated with cherubs, a touch of ostentation in a peaceful and otherwise low-key setting. Apparently the slab was so heavy that it had to be hoisted over the churchyard wall by crane. Mistress of the Art of Death is a great title and it belongs to a book written by Ariana Franklin, which won the CWA Ellis Peters Historical Award in 2007. I haven’t read the book as yet, but the reviews were impressive. It’s now a chunky paperback, and the story-line looks interesting. In Cambridge in 1171, a child has been killed and other children have disappeared. The Jews, who provide a large part of King Henry’s revenue, are being accused of the crimes by angry locals. Simon of Naples is called in to investigate and his associates include a young doctor called Adelia Aguilar – who is the eponymous mistress of the art of death. The paperback publication coincides with the appearance in hardback of a follow-up with another good title: The Death Maze. Adelia returns at the king’s behest to find the killer of Rosamund Clifford; his wife has already been accused and is suspected of plotting to start a civil war against him. When it comes to historical mysteries, I have long had a mild preference for books set in the Victorian and Edwardian eras. For instance, I really love Peter Lovesey’s Sergeant Cribb series and The False Inspector Dew, set in the first part of the last century is a masterpiece. Certainly, I enjoy the likes of Ellis Peters too, but I tend to take Brother Cadfael in small doses. However, the success of C.J. Sansom (whom I haven’t read yet) has made me realise that a great deal of excellent work is being done right now in a wide range of historical periods. I look forward to sampling the work of Ariana Franklin. The arrival of a new book by Adrian Magson is a reminder of the worthiness of his publishers, Crème de la Crime. They are a small independent press, publishing crime fiction set both in the present day and in the past. Among others, they have published Bernie Crosthwaite and David Harrison, and recent titles have come from the likes of Linda Regan, Maureen Carter and Gordon Ferris. It seems to me that small publishers deserve every encouragement in these difficult days, for their hard work ensures that a range of capable authors reach an audience. If they didn’t exist, readers would still have the best-sellers backed by handsome marketing budgets, but the world of fiction would be poorer. As for Adrian Magson, his latest is No Kiss for the Devil. Again, it features his regular sleuthing duo, investigative reporter Riley Gavin and ex-military policeman (now a private detective) Frank Palmer. This time, someone to whom Palmer was once close has been brutally murdered, so he has a personal stake in the investigation. Adrian is a highly professional writer who often contributes columns offering advice for fledgling authors to writing magazines. He and I will be appearing on the same panel at Crimefest in Bristol next month (not long to go now!) Last year we both participated in a fringe session at the Harrogate Festival and it will be good to work with him again. Perhaps it isn’t surprising that I find it so enjoyable to edit the CWA’s annual anthology. My relationship with the series began a very long time ago. When I was twelve years old, in fact. I remember a visit to Sherratt and Hughes’ bookshop in Manchester (sadly, it is no more) with my mother and asking for a copy of the new CWA anthology as a Christmas present. In those days, the anthology was known as The John Creasey Mystery Bedside Book. When the present duly arrived, I enjoyed the stories, and I was also interested to read about the Crime Writers’ Association, which sounded a very august body (this was long before I had met a published writer of fiction.) Of course, the thought that one day I might be a member of the CWA, let alone edit the anthology, seemed rather fanciful. Over the years, before I joined the CWA, I picked up several copies of past anthologies. The very first came out in 1956, just three years after the formation of the CWA. It was called Butcher’s Dozen and the introduction expressed the view that the market for the short story was ‘bleak’. Not much change, there, then. Yet, miraculously, the short form still continues to survive and, indeed, thrive – in artistic if not financial terms. My predecessors in the editorial chair included such luminaries as Julian Symons, Michael Gilbert, Elizabeth Ferrars, Harry Keatiing, Michael Z. Lewin, Peter Lovesey and Liza Cody. Quite a roll call. I made one significant change when I took over, deciding that each book should have a distinct (albeit broad) unifying theme. The first theme I chose was ‘the perfect crime’. Among the contributors to Perfectly Criminal was an excellent, youngish writer then living in France by the name of Ian Rankin. His offering, ‘Herbert in Motion’, went on to win the CWA Dagger for best short story of the year. Before long he won the CWA Gold Dagger and the rest is history. In introducing Ian’s story, I said: ‘the real reason why he is, I believe, destined to become a major force in the genre is that his strengths are the conventional yet all-important ones: imagination, insight and a determination to keep the reader entertained.’ Well, I don’t get all my prophecies right, but I reckon that was spot on! Not long to go now before Crimefest 2008. I’m looking forward to seeing a number of good friends, and also to meeting a number of people for the first time – including, I hope, Maxine Clarke, whose blog ‘Petrona’ is required reading as far as I’m concerned. I’m moderating one panel and appearing on another to be moderated by Colin Campbell (someone else I haven’t met previously.) The panel I’m moderating is at the somewhat unattractive time of 9 a.m. on Sunday morning, but it should be good fun provided I don’t oversleep – always a likelihood. One of the panellists is Neil White, again a writer I haven’t met before. Yet we have one or two things in common. Neil, like me, is a solicitor who writes in his spare time. I came across his first book, Salem, through a mutual friend, a partner in my firm called Duncan McAllister. Since then, Neil’s career has really taken off, with a contract from Harper Collins. He’s just sent me a copy of Fallen Idols, which has a football background, while Lost Souls has just come out in paperback. Laura McGarrity is a detective who features in the two recent books and the story behind the naming of this particular character is that Neil borrowed the name of Duncan’s wife. And it just so happens that the real Laura McGarrity works not only in my ofice, but actually in my department. Truly a small world. Most people seem to remember the names of detectives much more easily than the names of their creators. It’s quite sobering how reputations can fade; it’s true even of writers who sell very well. Who, for instance, now recalls the name of Marten Cumberland? Yet, although never in the front rank, he was at one time well regarded. ‘The Sunday Times’ said his work was ‘solidly intelligent’, ‘The Observer’ thought him ‘most dependable’ and the TLS described him as ‘a born story-teller’. I’ve picked these comments almost at random from a long list of positive reviews to be found on the dust jacket of a book called The Charge is Murder. It was first published in 1955, the year of my birth, yet it seems today to belong to a vanished age. I remember my father reading a few Cumberland novels, borrowed from the library in the 1960s, but I’ve never bothered with them. Until now, having chanced upon an eBay auction, when this novel was for sale; the copy bears a personal inscription from Cumberland (‘with savagely good wishes’) as well as a literary agent’s stamp. So I thought I would bid – and there was no competition. During his lifetime, Cumberland was best known as the creator of a wily French detective, Commissaire Saturnin Dax. It’s a good name for a character, I think, very memorable, if slightly suggestive of an evil alien mastermind from 'Doctor Who'. The Charge is Murder sees Dax investigating the murder of a man whose body is found in a shabby cinema. He has been shot, but no weapon can be found, and there is no clue as to his identity. Cumberland lived from 1892 to 1972 and the first of the Dax novels appeared in 1940. There’s one title I love (haven’t read the book): Murmurs in the Rue Morgue, published in 1959. Very pleasing, don’t you think? William A.S. Sarjeant wrote a CADS supplement about the Dax books, called A Policeman in Post-War Paris, and it contains plenty of info for anyone interested in exploring further. I believe Geoff Bradley, editor of CADS, may still have one or two copies available. I’ve spent the last two days at Old Trafford, watching the Test Match between England and New Zealand. I’m a cricket fan, so this was no hardship, and in fact my parents first got together at a cricket match, so perhaps I have cricket to thank for my very existence. Mind you, I have a good many friends whose judgment is otherwise impeccable who really hate the game with a passion. But, once you develop an interest in its complexities, it does tend to become addictive. Though I can see why a day spent watching a match ended hours early because of bad light (as happened on Friday) can seem very frustrating. Friday was spent in the company of colleagues and clients, while yesterday I went as guest of Michael Malone, a former partner of mine, with whom I wrote three editions of a book about equal opportunities law. When he left to become a judge, I found writing the fourth edition on my own a rather testing experience in itself. It was good to catch up with him. Michael, incidentally, had a short career as a crime publisher – he was the brains behind Ross Anderson books, which published Bertie Denham, Glyn Hardwicke and others in the 1980s..
Cricket is a game with an impressive literature, and it has also featured in a good deal of crime fiction. Conan Doyle was a keen cricketer and Sherlock’s brother Mycroft was named after the great Derbyshire bowler William Mycroft. Perhaps the most famous cricketing crime scene appears in Dorothy L. Sayers’ Murder Must Advertise – Lord Peter Wimsey was, needless to say, a splendid cricketer. Julian Symons and Henry Wade (in the excellent Lonely Magdalen) are among the many other classic writers who have included cricketing scenes in their novels. I suspect that none of them dreamed the day would ever come when you could watch action replays of key moments on huge television screens erected behind the boundary line. It’s more difficult to build an entire crime story successfully around cricket. There is an old green Penguin called Alibi Innings by Barbara Worsley-Gough, although when I read it a long time ago, I wasn’t too impressed. Testkill, a joint effort by former England cricket captain Ted Dexter and journalist Clifford Makins was another Penguin book; I enjoyed it much more, although it hardly qualifies as high quality literature. Perhaps the most daring use of cricket was in Playing for the Ashes, by Elizabeth George. For a female American writer to build a very substantial book around a game that isn’t exactly big news in the States seems counter-intuitive, to say the least. But I would guess that, with the exception of Murder Must Advertise, Playing for the Ashes has sold more copies than any other crime novel with a cricketing element. Rather unexpectedly, there is a tradition of nuns turning to amateur detective work. The great American critic and mystery novelist Anthony Boucher, who gave his name to Bouchercon, created Sister Ursula. And nowadays we have Sister Agnes, the heroine of Alison Joseph’s series of low-key but appealing novels. There is a new radio series, on ‘Woman’s Hour’, based on Shadow of Death, the most recent Sister Agnes book, and starring Anne Marie Duff. This is a sound novel, published last year and involving the 17th century Hawker Archive, a collection of beautifully preserved books on spells and magic, together with hand-written journals. This sort of material can provide the basis for an interesting book, and Alison Joseph makes good use of it. Alison has a great deal of experience of radio work. She is a former presenter who has written original radio drama as well as adaptations. It’s an area I’m interested in myself -I did some writing for local radio (mainly comedy) when I was a student at Oxford and a member of its Broadcasting Society, but never took it any further after I started working full-time. One of these days, I'd like to have another go at it. Today I'm glad to have the chance to respond to Patti Abbott's invitation to talk about a book that has been forgotten, but deserves to be remembered. My forgotten book is Reputation for a Song, by Edward Grierson. It was first published in 1952, and I was originally alerted to its existence by Julian Symons, who spoke of it highly in his classic study of the history of crime fiction. Bloody Murder. Symons was a tough critic, but he rarely praised a book that did not have considerable merit. And when I read Reputation for a Song, I was impressed. Grierson was a barrister by training, and his understanding of the legal system and its shortcomings is evident in this book. The question is not the identity of the murderer, but whether he will hang for his crime. The key characters are Robert Anderson, an unassuming country solicitor, and members of his family. His wife is too clever for Robert and she encourages their son Rupert to resent her husband. In a final quarrel, Rupert kills his father and he is immediately arrested. There is a long and cleverly constructed trial scene, with different aspects of the truth brought to life, suppressed and distorted by the witnesses in the case. It is a sharply ironic novel, a distant descendant of the best work of ironists such as Anthony Berkeley, Richard Hull and Bruce Hamilton. The final sentence is low-key, yet truly chilling. Reputation for a Song was highly successful and swiftly became a Book Society Choice and ‘Daily Mail’ Book of the Month. In the US, it was adapted for television. Grierson’s second crime novel, The Second Man, won the CWA’s top award in 1956 and again made expert use of his legal know-how. He wrote a couple more crime novels, as well as historical fiction and a memoir, but he never surpassed that brilliant initial achievement. Perhaps because of this, his own reputation, although not sold for a song, has faded. But even though it is inevitably dated, this novel has something timeless to say about the nature of justice, and it deserves not to be forgotten. It’s taken a bit of arranging, I can tell you, but I’m delighted to say that the evening of 4 June will see a double celebration. My firm, Mace & Jones, has decided to mark Liverpool’s year as European Capital of Culture by launching a short story competition. 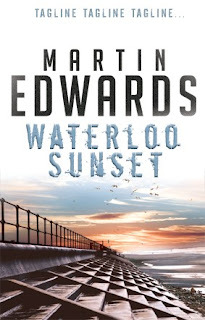 And the same occasion will also see the official, if marginally belated, local launch of Waterloo Sunset. The event will be introduced by Colin Hilton, chief executive of Liverpool City Council. And this is all going to happen at Liverpool’s new, and rather glamorous city centre hotel with a Beatles theme, the Hard Day’s Night Hotel. There is always a tendency for cultural celebrations to focus on visual and performing arts, and for literature to be rather neglected. I did wonder if Liverpool’s cultural year might go the same way, and so I’m glad that my partners have agreed to fly the flag for the written word. It’s true to say that the main reason I joined Mace & Jones rather than some other firms when I was about to qualify as a solicitor many years ago was that both the senior partner and his deputy had published books; I felt they were people with like minds, and so it proved. Both men understood my literary ambitions, and were never patronising about those ambitions (unlike some of those from glitzier firms who interviewed me) and I loved working with and learning from them. Details of the short story competition will be found on the firm’s website shortly. In the meantime, anyone who would like to come along on the evening on 4 June should drop me an email, so I can sort out invitations with my colleagues in our marketing department who are working hard to make the event (which runs from 6 pm to 8 pm) thoroughly enjoyable. The premise is familiar to Austin Powers fans. A daring adventurer is cryogenically frozen by an evil mastermind and wakes up, many years later, to continue the good fight whilst acclimatising to the extraordinary changes in society while he has been asleep. Adam Adamant is an ultra-gallant Edwardian swashbuckler, played straight-faced by Gerald Harper, who in 1902 is betrayed by his lover and put into suspended animation by his sinister adversary, ‘The Face’. He wakes up in 1966 to be confronted by the London of the Swinging Sixties. Bewildered, he is befriended by the lovely Juliet Harmer, whose adoration he doesn’t exactly reciprocate. Thanks to the wonders of satellite television, I’ve finally seen the first episode, forty two years after I first saw it. It was tremendous fun, from the melodramatic James Bond style theme song belted out by Kathy Kirby – a big name in those days – to Harper’s odd combination of prudishness and elegant violence. The series wasn’t as good as ‘The Avengers’. The scripts were patchy, although sometimes very clever and rather witty, but the production values were inferior and the show inevitably suffered by comparison. But viewed today, it has an additional layer of appeal – the Swinging Sixties seem almost as remote to us now as 1902 did to Juliet Harmer. The first episode, at least, is well worth watching if you ever get the chance. I wasn’t familiar with the real life story behind the movie, so I was able to watch Hollywoodland without the complication of measuring the fiction against established facts. This didn’t spoil my enjoyment in the slightest – it’s a good film, with some first rate acting. The story concerns the mysterious death of George Reeves, who played Superman on television with great success, but who was never able to build upon that achievement, although he did have a small part in From Here to Eternity. Reeves had a mistress, Toni Mannix, an older woman who was married to an MGM mogul, who spoiled him rotten. However, eventually he tired of her and found a girlfriend of his own generation. When he was found shot, the preferred theory was that he committed suicide. But there are other possibilities, with fingers pointing at Toni, at her husband, and at the new lover. The film introduces a fictional private eye called Simo, played excellently by Adrian Brody. His investigation is inter-cut with the story of Reeves (Ben Affleck.) Mr and Mrs Mannix are superbly portrayed by Diane Lane and Bob Hoskins. When Hoskins starred in the brilliant The Long Good Friday, he showed contempt (unwisely) for a couple of American Mafiosi. Here, in an almost equally strong, if less central, role, he is highly convincing as a Hollywood boss with gangster world connections. The film is a cut above many thrillers. The focus on the private eye’s private life is appealing – the characters matter rather more than in so many movies of this kind. And even though Simo didn’t exist in real life, by the time the credits roll, we know him at least as well as we know George and Toni, who did. There’s no shortage of Sherlockian pastiches. I have enjoyed writing a handful myself – there’s a great deal of pleasure to be had in trying to capture Watson’s voice, and the macabre atmosphere that Conan Doyle conjured up in the best of his stories. My latest venture into Sherlockiana is a story which explores the activities of the Amateur Mendicant Society; it will be published in the Strand Magazine (the newish American journal of that title) in the near future. In the meantime, there’s a new gathering of tales to enjoy, Sherlock Holmes: The Game’s Afoot, published by Wordsworth. The editor, David Stuart Davies, is an extremely knowledgeable Sherlockian scholar, as well as being a very versatile fellow – magazine editor, writer of short stories and novels, and playwright. David has gathered together twenty stories by a range of accomplished writers. The most notable contributor, perhaps, is June Thomson, author of many enjoyable detective novels, as well as several highly regarded collections of Sherlockian stories, and a biography of Holmes and Watson. The other contributors include experts such as John Hall, Matthew Booth, Rafe McGregor and Davies himself The story titles include such gems as ‘The Adventure of the Intermittent Jigsaw Puzzle’ and ‘The Adventure of the Hanging Tyrant’. Davies’ introduction highlights some of the reasons why Sherlockian pastiches continue to find an enthusiastic readership – it’s not just a matter of the mysteries, or even the atmospheric period detail, it’s the flavoursome nature of the characters. And not just Holmes and Watson themselves. Davies refers to ‘the vengeful one-legged murderer Jonathan Small; the avaricious red-headed pawnbroker Jabez Wilson; and the strange creeping Professor Presbury, to name but a few.’ I agree, and it’s really no surprise that the Holmes magic continues to fascinate, even if those of us who follow in Conan Doyle’s footsteps recognise that we can never hope to emulate the Master at his best. At around the same time that I came across Agatha Christie, I was introduced to the very first series of ‘Doctor Who’ by my godfather Roy Mills and his daughter Carolyn, who has been a lifelong friend and to whom, along with the rest of her family, I dedicated The Arsenic Labyrinth. In those early days, ‘Doctor Who’ was in black and white, and featured in the title role the irascible William Hartnell. Like Carolyn, I became a fan from the outset, and continued to watch while Patrick Troughton, Jon Pertwee and Tom Baker played the time-travelling Doctor. After that, I lost touch with later series, but the revival of the show a few years ago caught my interest, and I’ve been a keen follower of the new version ever since. I can't think of a series that has, over the years, provided more enjoyable family viewing. Needless to say, therefore, I relished last night’s episode, in which the Doctor, now played by David Tennant, travelled to 1926 and found himself caught up in a murder mystery in which one of the characters was Agatha Christie herself. By the end of the programme, we had an explanation for her famous bout of amnesia, as well as the solution to a barmy mystery puzzle, involving murder by giant extra-terrestrial wasp. It was all great fun, with plenty of jokes to amuse Christie fans. I’m not sure how widely known ‘Doctor Who’ is outside the UK, but the cleverness of the concept and the wittiness of the scripts have kept the series going, despite a few breaks, for over 40 years. Long may it continue. I’ve finished Brian McGilloway’s debut novel, Borderlands, and I enjoyed it. After a steady beginning, the pace develops and there is plenty of action, coupled with a plot of increasing complexity that has its roots (like so many of the best murder plots) buried in the past. But the book has, in my opinion, two particular stand-out features. The first is the setting, on the border between Northern Ireland and the Republic. Everyone knows that tensions between the two communities have run high for generations. Yet, although it may not be perfect, the peace process seems, from across the water, to have worked astonishingly well, and in a way that few would have dared to dream of twenty years back. McGilloway handles relations between the cops of North and South in a subtle and, as far as I can judge, highly credible way. The character of Inspector Benedict Devlin himself is another real strength of the book. Devlin is a family man, and a faithful one. Even though he is tempted off the straight and narrow, he doesn’t wander so very far, which is rather unusual in crime fiction. He is an ordinary man, not someone naturally tormented by demons, and yet he still has personal conflicts to resolve. The way that McGilloway addresses these dilemmas struck me as interesting and, again, believable. All in all, then, a very assured debut. I look forward to the follow-up, Gallows Lane. Yesterday evening I attended the Insider Liverpool Professional Awards ceremony for 2008. It's not the sort of event at which you'd catch my fictional alter ego, Liverpool lawyer and amateur sleuth Harry Devlin - a rather glitzy black tie do, organised by the Insider magazine. 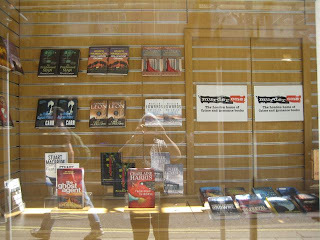 This is one of a couple of photos of Waterloo Sunset featuring in the window of the Murder One bookstore in London’s Charing Cross Road that were, happily, waiting for me when I returned home after a couple of days working away (the last couple of blog posts were scheduled in advance.) The photos were kindly sent to me by Maxim Jakubowski, who owns the shop and has played an influential role in the crime fiction world for more than twenty years. I first came across his name in the 1980s, when he edited the Zomba omnibuses which introduced such names as Cornell Woolrich, Fredric Brown, David Goodis and Jim Thompson to a new generation of readers, including me. Each volume contained four novels and a pithy introduction; each was a real find. Maxim and I met at the 1990 Bouchercon in London. At that time, I hadn’t published a novel, but I entered a competition based on the TV show Mastermind, but focusing on crime fiction, and to my genuine surprise, I won it. Maxim was the quizmaster and Geoff Bradley, editor of CADS and someone else I’d never met before, kept the score. We continued to bump into each other at crime conventions, notably the late lamented Shots on the Page (at Nottingham) and Crime Scene (at the National Film Theatre in London.) Over the years, Maxim has included stories I’d written in several anthologies that he’d edited, something for which I’m very grateful. He’s someone who seems to know everyone – not surprising, since a great many people who love crime fiction visit his shop every year. If you don’t know it, do have a look in next time you’re in London. Not only does it contain a vast range of contemporary books and other crime fiction items; there is also a very good section hand section downstairs. The recent publication of M.O. : crimes of method has prompted me to think back to my first experience as an anthologist - dating back to 1992. Gosh, where did the time go? What happened was this. I had enjoyed the experience of becoming a published novelist, and loved the social side at gatherings of the Northern Chapter of the Crime Writers’ Association. I came up with the idea that we might produce a book showcasing our work. There was general enthusiasm, and I found a small publisher (Didsbury Press, run by a chap called Patrick Quinn who was a client of my firm) who were willing to bring out the book. After that, I was bitten by the anthology bug. Three years later, Northern Blood 2 made its appearance, and the East Anglian Chapter of the CWA asked me to co-edit their anthology. The next step was for the CWA committee to ask me to take over editorship of the annual CWA anthology, and I’ve managed to produce one book almost (but not quite) every year since 1996. There are details of each of them on my website. Marketing short story collections doesn’t get any easier, but it’s a privilege to have the opportunity to work with so many talented writers. I much appreciate the generosity so many contributors have shown over the years; one thing is for sure, they definitely don’t write the stories for the money on offer…. There seems currently to be no end to the influx of Scandinavian crime novels in translation and the latest that I’ve read is The Fourth Man. The author is K.O. Dahl, a new name as far as I’m concerned, and the translator – who, it seems to me, has done a good job – is Don Bartlett. Dahl is touted as ‘Norway’s answer to Henning Mankell’ and the blurb compares this ‘hard-boiled psychological thriller’ to Hammett and Cain, which may be pushing things a bit too far. He sells very well in Europe and has won awards, and although I felt this book was something of a curate’s egg, I can see why Dahl has won such acclaim. The Fourth Man features an Oslo cop, Detective Inspector Frank Frohlich, who becomes obsessed with a mysterious but highly desirable young woman called Elisabeth. The snag is that her brother Jonny is a gangster with a criminal record and it soons begins to look as though Elisabeth too has a dark side to her life. When she disappears from Frohlich’s life, the detective becomes embroiled in a complex criminal scheme. Someone wants him dead – but who, and why? The plot is convoluted – something I usually enjoy, but I did find the central mystery less than absorbing, and foresaw the major twist a long way before the end. What appealed to me most about the book was Frohlich, and his relationship with his colleague Gunnarstranda. The scene in which Frohlich is nearly roasted alive in his own sauna was vivid and memorable, a good example of Dahl at his best. So, not a masterpiece, but certainly interesting and a bit different. Crime talk is interrupted for a special occasion. It’s the 80th birthday of Burt Bacharach, introduced at this year’s Grammy awards as ‘the world’s greatest living composer’, and the man who, through a couple of tv shows, fired my interest in music almost forty years ago. Marlene Dietrich worshipped him, Elvis Presley, Frank Sinatra, the Stranglers, the Manic Street Preachers, the White Stripes and the Beatles amongst countless others covered his hits, Elvis Costello and Noel Gallagher have performed on stage with him at live concerts that I’ve had the pleasure to attend. His co-writers include not only the great Hal David, but also the playwright Neil Simon, poet James Kavanaugh, Jerry Leiber, Gerry Goffin, Carly Simon, rapper Dr Dre, Costello, Cathy Dennis and Tim Rice. He discovered Dionne Warwick, wrote a solitary Broadway show that changed the musical forever and paved the way for the Lloyd Webber-Rice generation, and won three Oscars when he turned his attention every now and then to movies. He had cameo roles in all the Austin Powers films, and he’s just written a new orchestral work for the Sydney Symphony Orchestra, to feature on a forthcoming live CD. It is simply not possible to escape his songs. They are played everywhere, so it’s best to come to terms with them. But it isn’t hard; his melodies have always lifted my spirits whenever I’ve felt worried or weary. I admired his work when it was deeply, deeply unfashionable. Now the prejudice against what is mistakenly described as easy listening (though his music is often complex) is fading away at last. I owe Burt Bacharach a lot and it’s a great pleasure to wish him many happy returns. My copy of the latest issue (#104) of ‘Mystery Scene’ magazine has just arrived. 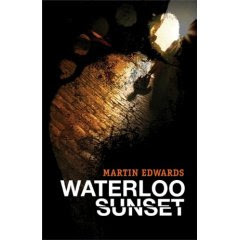 It includes my article about Benjamin Black (John Banville in criminal guise) and something I hadn’t expected, a kind review of Waterloo Sunset (‘Edwards handles a complex plot and a vivid cast of characters with a sure hand…[and] mixes humour and suspense to good effect’) by Barbara Fister. The good things in this issue include a terrific article about the classic Max Carrados mysteries by Michael Mallory, a tribute to the late Ed Hoch by Jon L. Breen and a first-rate section about ‘small presses with passion’. The latter includes a wide-ranging article by Mary V. Welk, which covers British as well as American small presses, and features by Ed Gorman on Ramble House and Stark House Press. If you haven’t come across ‘Mystery Scene’, take a look at it. It covers a very broad range of mystery fiction, and I’ve never read an issue that didn’t contain something good, and a lot of information previously unfamiliar to me. Ed Gorman wondered, in a typically thought-provoking blog post the other day, about the value for authors of attending crime fiction conventions. One thing is for sure: unless you are in a very small minority of huge sellers, the cost of attendance will exceed whatever revenue you generate through book sales. And it’s also true that, in order to find time for writing, one has to put a limit on the time devoted to networking at conventions and elsewhere. This is especially true for people like me who also have to juggle their writing with a full-time job. And yet. A convention can be a great way of meeting old friends, and making new ones, who share a common passion for books. And a convention in an unfamiliar location offers a good excuse for exploring fresh places. A case in point was my trip to Left Coast Crime in Seattle last year. I knew little of Seattle, and it would never have occurred to me as a tourist destination. But the city massively exceeded my expectations, and even the weather was much kinder than I’d been led to expect. I also met some very agreeable people, and one of them – whom I bumped into in the excellent mystery bookstore – was Caroline Upcher, a fellow Brit currently living in the States. Caroline writes under her own name, but her crime fiction appears as by Hope McIntrye. Her central character is Lee Bartholomew, who is a ghost writer. Caroline, well versed in the publishing industry, knows a good deal about ghosting and her books are accomplished pieces of work. The most recent is How to Cook for a Ghost, which has a well-researched restaurant setting. It is well worth seeking out, as are its predecessors, How to Seduce a Ghost and How to Marry a Ghost. In a prefatory note, Caroline mentions enjoying the company of a number of authors at Bouchercon, Malice Domestic, Left Coast Crime and MWA events (she kindly includes me in the list) and I think this is really the answer to the question raised in Ed’s blog. If I went to a convention solely focused on sales and business, I would end up disappointed. But I don’t; it’s all about having a good time in good company. If the readers I meet are tempted to sample my books, that’s a bonus. I’m not, by nature, a great enthusiast for ‘corporate hospitality’, but as a partner in a law firm, it is inevitably an aspect of my working life. And sometimes the events prove hugely enjoyable. Last night was a great example; a wonderful concert by the Royal Liverpool Philharmonic Orchestra, followed by supper and some very good company, including that of the chief conductor of the orchestra, Vasily Petrenko. The music was a combination of Beethoven (my favourite classical composer) and Mozart (who isn’t bad either.) The soloist for the clarinet concerto was Mark Simpson, a stunningly talented 19 year old who is the only person ever to have won BBC Young Musician of the Year and the BBC/Guardian Young Composer of the Year awards and he too joined the party afterwards. The Philharmonic Hall has excellent acoustics and the 1930s Art Deco building is a great treasure. It was good, during the interval, and at the end of the hottest day of the year so far, to look out at the sun setting over a city scape combining great buildings and cranes engaged in construction of the new Liverpool. Vasily is a young (32) and extraordinarily energetic and charismatic conductor whose dynamism is perfectly suited to the drama of Beethoven’s orchestral masterpieces. I was lucky enough to sit next to him during the meal and he proved a most agreeable companion. Amongst other things we talked, of course, about music and mystery fiction and recommended to each other a few films that combine the two – for instance, he hasn’t yet seen The Page Turner, which I discussed on this blog a few weeks ago, and which I found eerie and memorable. Music features in a good deal of crime fiction, but books set in the orchestral world are not so common. A good one that springs to mind is Cyril Hare’s When the Wind Blows (known in the US as The Wind Blows Death) where the key to solving the mystery is a musical clue. A very sound example of Golden Age fiction. I can’t remember a time when Irish crime fiction flourished to the extent that it does today. I’ve almost finished Brian McGilloway’s acclaimed novel Borderlands, and it’s going very well. I was a bit nonplussed to find that his detective hero, Inspector Benedict Devlin, shares a surname with my own lawyer-sleuth Harry. But I discovered, years after I started the Harry Devlin series, that there have been quite a few fictional detectives called Devlin over the years. Why, I don’t know. The naming of characters is a curious thing, in fact, and it’s something to which I give quite a lot of thought, although sometimes with unexpected results. Many of my characters take their names from Derbyshire cricketers past and present (well, why not?) One day I was contacted by an Anthony Dessaur. He was researching his family and had discovered that The Devil in Disguise has a character called Luke Dessaur. When I explained that I'd borrowed the name of a rather obscure batsman called Wayne Dessaur, he said, 'My son Wayne will be delighted.' And sure enough, Wayne the cricketer got in touch and I supplied him with a suitably inscribed copy. An odd but entertaining encounter! But I digress, as so often - back to Irish crime. I’ve also received a new paperback by Ken Bruen, called Cross. Bruen has become an international star in recent years; but I haven’t read him as yet. Judging by various rave reviews, it’s a gap that needs to be filled. Declan Burke and Declan Hughes are two more writers whose work sounds appealing. It’s hard to tell what makes the difference between a steady career and stardom. In the 1980s, I thought that Bartholomew Gill, another Irish crime writer, had the potential to be very successful. Gill (this was a pseudonym for Mark McGarrity) created an interesting cop, Peter McGarr, but he never quite achieved stardom and died young, in 2002. A real shame; I felt his work deserved to be better known. John Brady is a writer of similar vintage who has not produced many books, but writes interestingly; Unholy Ground, which I read more than a decade ago, sticks in my mind as a very capable piece of work. Brady’s series hero is Matt Minogue. Last Friday was very hectic, but thankfully I had time for a quick visit to the opening ceremony at the newly extended and much-revamped library in Lymm. There is also a citizens’ advice bureau on site, and even though the mayor of Warrington Borough Council and other dignitaries present must have been exhausted after a night spent waiting for the local election results (a hung council was the outcome) there was no disguising the delight across the political divide at the realisation of a long-held dream. Is there good reason to be excited about the improvements made to a village library? I think so. For instance, there has been intelligent investment in technology. Fiona Barry, the library service manager, gave me this example: ‘You can now listen to a selection of stories on MP3 player format. The library includes batteries, so all you need to provide is your headphones. These pocket sized players make listening even easier, especially if you are jogging, decorating or ironing. There are books available for adults and children, and the cost is just £1.20 for 3 weeks' loan, the same as CD or cassette format - with no charge made to children and teenagers." The library now hosts a couple of readers’ groups; I’ve talked with both of them in recent weeks and found their enthusiasm for fiction very heartening. And, all being well, the Victorian murder mystery that I staged a fortnight ago will be the first of many events. I’ve been a library member since I was a child and I’m a passionate believer in the value of libraries of all kinds – so long as they are staffed by book enthusiasts, and properly funded. It does seem to me that some of the social problems that we face in this country can be addressed, at least in part, by an increased emphasis on community cohesion, and on the things that bring us together rather than those that divide us. Libraries (rather like the post office network, which is, depressingly, been scaled down at this very moment) have much to offer as places for people of all backgrounds to meet, as well as to share common interests – above all, of course, literature. It seems to me to be a very good idea to have an advice bureau in the same premises – a place with such valuable facilities can prove a magnet to many people who gave up the book-borrowing habit long ago. My hope is that the achievements of the library service in my neck of the woods will be replicated elsewhere, and that instead of talk about cutbacks, the focus for the future will be on an expanding and flourishing network of libraries nationwide that contributes to a genuine improvement in the quality of life for all sectors of society. It could happen - couldn't it? Never mind ‘where do you find your ideas?’ A more interesting question to put to any writer of traditional detective stories is ‘how do you construct your plots?’ A sizeable number of my contemporaries don’t have a clear idea of how their mystery is going to unfold when they start on chapter one. But the more complex the plot, the more planning is generally required. Kate Ellis is someone who shares my love of the convoluted plot. She sets herself a particular challenge by combining the main mystery in her Wesley Peterson books with a corresponding puzzle set in the past. I admire the way she juggles the different elements, especially in her latest, The Blood Pit. Kate’s writing style, as I’ve mentioned before, was influenced by the early episodes of ‘Taggart’, which began with several apparently unrelated plot strands that were woven together gradually so as to lead to an amazing and unexpected conclusion. She usually knows the outcome of her mysteries (although she’s been known to change her mind about the identity of the murderer at the last minute.) And she plots the whole book out…in a flow chart. Suffice to say that this is a much more organised approach than my own – which relies rather heavily on committing details to memory. But it’s fascinating and obviously effective, and if I were more methodical, I’d give it a try myself. Just back from a bank holiday week-end in Wales, to find that my first attempt to use Blogger’s new method of scheduling a blog post in advance (for yesterday morning) seems to have worked out; something I didn’t take for granted, since my command even of simple technology is rather hit-and-miss. And it was great, on returning, to come across two very generous reviews of Waterloo Sunset, on Juliet Doyle's 'Musings from a Muddy Island', and Roberta Rood's 'Books to the Ceiling'. North Wales is one of my favourite places in the world; a beautiful area that I’ve known since childhood. This week-end we had pretty much the best weather of the year so far (not saying much, to be honest) and there was the chance to enjoy trips by funicular tram, cable car (the trip up the Great Orme is apparently the longest cable car ride in Britain) and speedboat. Castles, traction engines, Punch and Judy shows – all the elements of a traditional British setting were in evidence. All very enjoyable, and I had the chance to think about some aspects of the current work-in-progress, as well as making a start, at long last, on Ann Cleeves’ latest book White Nights. Oddly enough, Wales has not featured extensively in crime fiction, although I’ve set one or two short stories there. Lindsay Ashford, who lives in Borth, writes a series set in mid-Wales, and there have been a few notable novels with a Welsh background – an example that springs to mind is Christianna Brand’s Cat and Mouse, while I’m sure there must be quite a few that I’ve forgotten. However, I’m not convinced that the full potential of this marvellous country as a background for detective fiction has yet been adequately explored. One day, I might have a go at a Welsh-based crime novel myself. An odd coincidence. Only a few days after posting about Marple in Cheshire, I bought, via eBay, a first edition of Dover Beats the Band by Joyce Porter. Porter created other series characters – Eddie Burke and ‘the Hon. Con’ – but Chief Inspector Dover of Scotland Yard was much more popular. I even have a distant memory of his appearing on television – in, I think, an episode in that wonderful but now forgotten 1960s series ‘Detective’, which saw many great characters brought to the small screen, sometimes for the one and only time. Dover was a comically unpleasant figure, aided and abetted by the long-suffering Sergeant McGregor. In Dover Beats the Band (which has a rather amusing dust jacket illustration by Keith Jones), Dover is described as ‘a detective who’s never rally gone beyond the stage of pinning every murder on to the victim’s spouse.) The law of diminishing returns notoriously applies to comic detectives, and many people reckon that Dover One (which I read years ago and enjoyed) remains the best of Porter’s books. Julian Symons scathingly said that the ‘Hon Con’ books are ‘best left unbroached’ and I suppose he may not have been on Porter’s Christmas card list after that. But I’m looking forward to giving this novel a go. Back to Marple. When I looked up Porter, it turned out that she was born there. Small world. There haven’t, over the years, been many Cheshire-born crime writers. Joyce Porter died back in 1990, before my first novel was published, and she’s now largely forgotten. This is no doubt because her attempts to stretch her crime writing skills in fresh directions were not particularly successful. But the creation of Dover surely earns her a place in the list of writers worth remembering. Inevitably, a writer awaits early reviews of a new book with a mixture of hope and trepidation. Over the years, I’ve been lucky with reviews, and although national newspapers now tend to focus more on best-sellers than when I started out, there is compensation in the rise of the online review. Of course, the quality of online reviewing is variable – but my impression is that it this branch of criticsm is rapidly becoming sharper and more sophisticated, especially in the case of certain well-established blogs and online magazines. In the case of Waterloo Sunset, the anxiety as to how reviewers will react has been increased by the fact that nine years have passed since the last Harry Devlin book appeared. The Lake District Mysteries have gained a good audience, both here and overseas, but will the reaction to a resumed series set in Liverpool be quite the same? I haven’t let this worry keep me awake at night – there’s no point in that – but the question has certainly passed through my mind. It matters all the more as this is a book which is very important to me and (I know, an author isn't necessarily the best judge of his own work) I am much more pleased with it than with one or two of my earlier efforts. In the US, very positive advance reviews have appeared in journals such as Kirkus, Publishers’ Weekly, Library Journal, and Booklist and I've lost no time in quoting them on the news page of my website. Now the first UK review (of which I’m aware) has featured on Crime Time. And of course I am delighted that it is again favourable. Too early to relax altogether about the critical reception of the book, needless to say, but so far I'm very encouraged. The pictures, by the way, are of the original artwork submitted by the UK and US publishers months before the book appeared. I was struck by how different they were. Yesterday evening proved enjoyable, with the launch of M.O. : crimes of method in the august, wood-panelled surroundings of the Committee Room up on the second floor of that splendid building, Manchester Central Library. The launch was attended by a number of contributors – in the photo, they are: myself, Karline Smith, Kate Ellis, Martyn Bedford and Bernie Crosthwaite. Karline, Martyn and I gave readings of our contributions to the book. The readings were recorded and, all being well, one or more of them may soon be available on the website of the publishers, Comma Press. An added bonus of the event was the chance to meet Karline and Martyn, neither of whom I knew before their involvement with the anthology. It was especially interesting to talk to Martyn, as I thoroughly enjoyed The Houdini Girl, which is possibly his best known novel, when it was first published in paperback some years ago. It’s a first class book that I strongly recommend. Martyn isn’t a particularly prolific novelist, and is thought of, I think, essentially as a mainstream literary writer rather than specifically as a crime novelist. But some, at least, of his work explores the territory of crime fiction and certainly his story ‘A Missing Person’s Inquiry’ is rather wonderful. I was delighted to have the chance to include it in the anthology. It’s taken a long, long time to put it together, but the new Crime Writers’ Association anthology has today been published by Comma Press. I’ve edited M.O. : crimes of method and, in total, it’s the sixteenth anthology of crime writing for which I’ve been responsible. • a creative writing tutor champions the ‘hardboiled’ school while a murderous student seems intent on proving it’s procedure that really counts…. 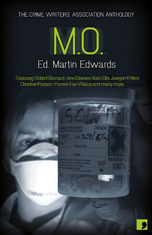 The contributors are: Robert Barnard, Martyn Bedford, Ann Cleeves, Bernie Crosthwaite, Carol Anne Davis, Jurgen Ehlers, Kate Ellis, Liz Evans, Paul Freeman, Jim Gregson, Mick Herron, Sarah Hilary, Andre Marois, Amy Myers, Christine Poulson, Katrine Smith, Douglas Stewart and Yvonne Eve Walus. And me, with a story called ‘Bedside Manners’.